Australia ground to their sixth successive Test victory in an arm-wrestle at Etihad Stadium in Melbourne, starting halves Bernard Foley and Nic White each kicking a penalty to ensure the Wallabies head to Sydney with an unassailable 2-0 lead in the series having extended their winning run against France in Australia to 10 matches in 24 years. France brought their passion and muscle as they attempted to "overcome the insult" of their 50-23 thumping in Brisbane last week, but their famed flair was lacking, as was the Wallabies' attacking precision, and the Australian Rugby Union will have been bitterly disappointed with the fare provided to the small crowd of 27,189 looking for tries rather than raking drop punts after Australia had scored 23 tries in their previous five victories. 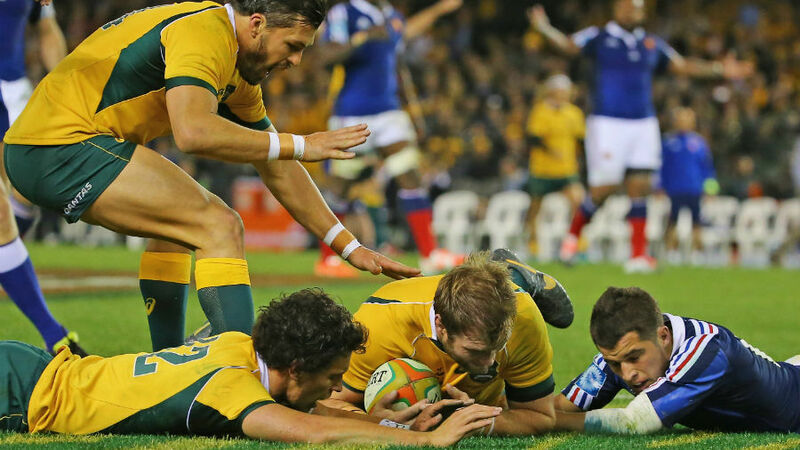 The victory, instead, was reward for the Wallabies' muscle and composure in the face of a revenge mission. 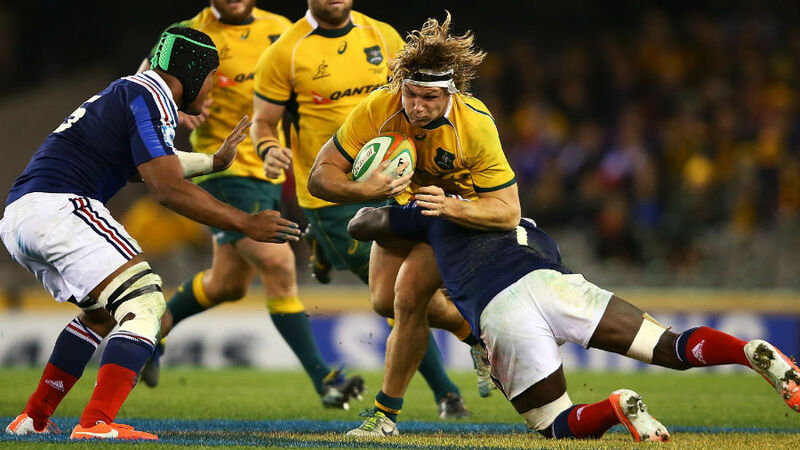 Wallabies captain Michael Hooper said "a grind like that puts us in really good stead". "You've just got to find a way to win, at the end of the day," he said. "All the good teams do that, and we're on our way to being in that sort of category." Ewen McKenzie was "happy with most parts of the game, but we weren't patient enough". "We created some opportunities but we gave away silly penalties and let them off the hook in the first half," the Wallabies coach said. "In the second half, we created the opportunities and weren't patient enough in the attacking quarter." McKenzie also lamented the lack of precision in his team's kicking game as they tried to create space n the offensive line..
"They had more numbers in the defensive line; they didn't have a back three," McKenzie said. "They had one guy back, and we needed to kick to get their wingers to go back, but we didn't kick smart enough, we didn't kick to the right places." Australia played out their first scoreless half in 52 years - since a 1962 Test against the All Blacks - and Foley put the first points on the board only in the 53rd minute following a penalty at the breakdown. White put them six ahead 11 minutes later and could have ensured McKenzie breathed easier but he missed three penalty attempts in the second half. 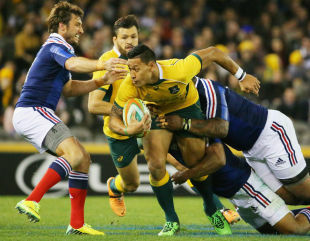 France's defence, breakdown effort and general intensity were much improved on their first Test effort, when they were torn apart in a seven-try blitz, and hence the Wallabies chose not to chance their arm in their own territory. France had opportunities to claim an early lead, but their lack of precision in attack, goal-kicking and the set-piece cost them dearly. Brice Dulin and Morgan Parra both missed penalty attempts while flanker Yannick Nyanga botched a try-scoring chance by failing to pick up his chargedown on Matt Toomua. France captain Thierry Dusautoir was "proud of the guys because we show another face ... we did a different game to last week, and it was really important to do it". France coach Philipe Saint-Andre, equally, was proud of his team because they ensured the game "was a contest". "last week it was just one team on the pitch," Saint-Andre said.